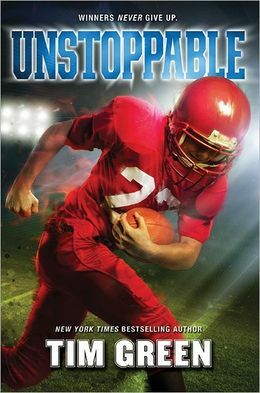 A middle-grade boy’s football ambitions crash against a cancer diagnosis in this frank tale by NFL star Tim Green. Unstoppable, by Tim Green. HarperCollins, 2012, 352 pages. It doesn’t seem like life could be any worse for Harrison Johnson, a kid too big for his age and now in his fourth foster home—actually a Dickensian workhouse disguised as a dairy farm. His one dream is to play football, even though all he knows of football comes from clandestine glances at the TV over the shoulder of his foster dad. But then a dramatic turn of events puts him back in the foster-parent market, and he’s placed with the ideal mom and dad for a kid with gridiron dreams. Mrs. Wilson is a lawyer and Mr. Wilson is a teacher at the local high school . . . as well as the Junior Varsity football coach. Harrison is as much a dream-come-true for the coach as the other way around: a natural athlete with years of suppressed rage longing for legitimate expression. He finds it on the playing field and under the Thursday-night lights—but his career has barely begun when a grudge hit by a resentful teammate leads to a knee X-ray and a terrible discovery: Harrison has bone cancer. Coach is at a loss when it comes to hospital beds and rehab, so he calls in his best friend “the Major,” an amputee from the Gulf War. I have two sports lovers. Thanks for this review!